We were staying abroad about a year ago and we had a great dinner on Diwali day. We had organised a potluck event and we also ordered some food from outside since the head count was more. We lit crackers that evening and had so much fun that day. From my part for the potluck, I prepared Besan Laddu, Rasamalai, Kai Murukku, Thattai and Cabbage Pakoda. Similarly others too brought their own delicacies. One of my husband's friends brought mini rava uthappam and andhra peanut chutney to accompany it. This was a great hit and was gobbled quickly. 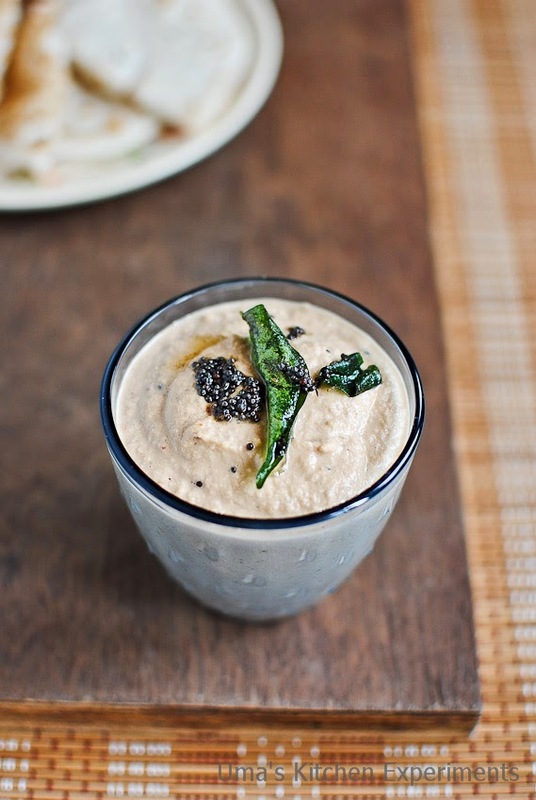 Though we have our ancestral roots in Andhra, our way of preparing the peanut chutney's was slightly different from the one what we ate during the dinner. Those were the days, I was not much into food blogging but then I couldn't resist myself asking for a recipe from her. She connected me to her mom who prepared the chutney and lol, I got the recipe from her. Though I like this dish very much, I get a chance to prepare it only few times as my hubby is not fond of peanuts. This is one of the chutneys I can eat as such and my love towards is endearing. 1) Dry roast the peanuts and rub it in between your fingers to peel the skin of it. Soak tamarind in 1/4 cup of water. 2) In a pan, add oil and heat it. When it is hot, add garlic, onion and dry red chillies. Saute till the onion become soft. Once done, transfer to a plate and cool down to room temperature. 3) In a mixei jar, add sauteed onion, garlic, dry red chilli, peanuts and soaked tamarind along with water. 4) Grind it to a smooth paste. Add water according to your required consistency. I added about 1/2 cup of water. 5) When it is about to finish grinding, add salt as per your taste and finish the grinding process. Transfer this chutney to a bowl. 6) Take the same pan and heat 2 teaspoons of oil for seasoning. 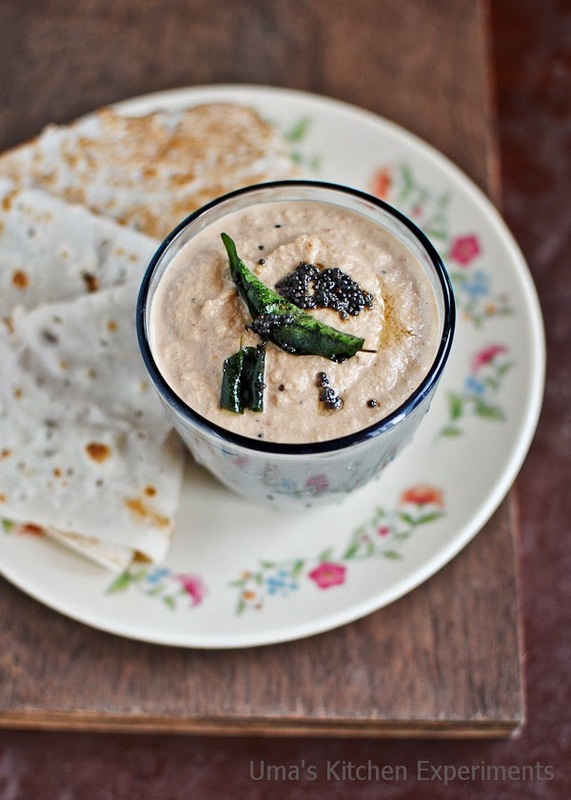 7) Add mustard seeds when the oil is hot and add curry leaves and asafoetida. Let it splutter. 8) Pour this seasoning to the chutney and mix well. 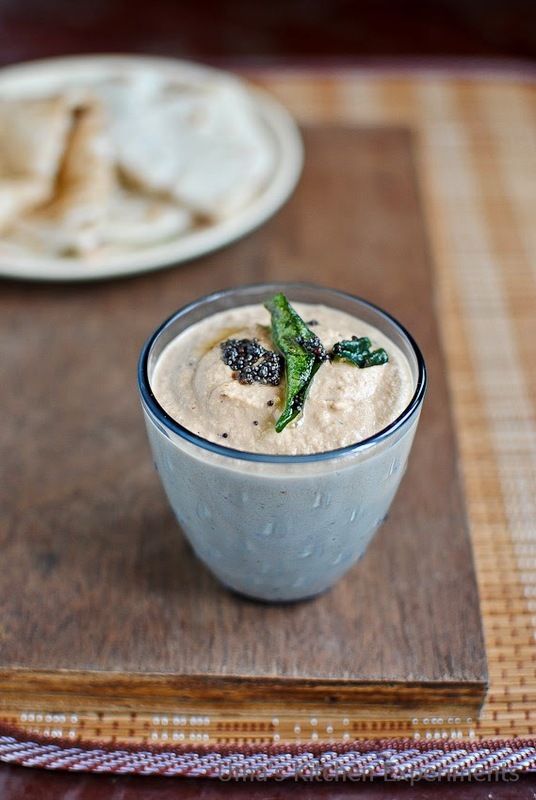 9) Serve with Idly or dosa. 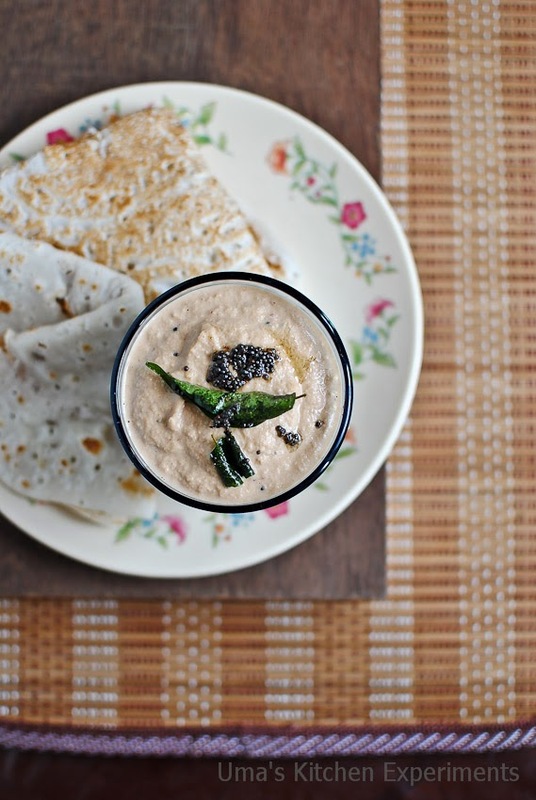 We had it with instant rice and urad dal dosa. 1) Adjust the red chilly quantity based on your taste. Chutney looks super yumm........ !!! Very different chutney na, never heard of adding onions in peanut chutney,will give a try. I used to cook using coconut instead of Onion. But as per your recipe I added onion too and it was good.